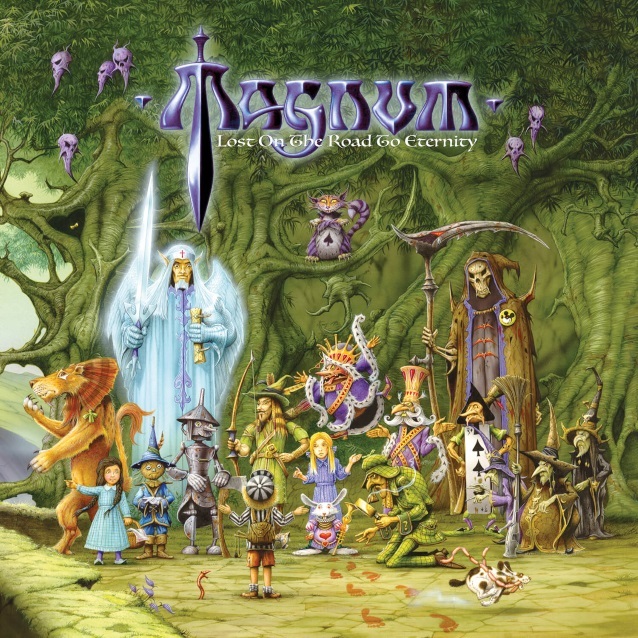 Magnum: "Lost On The Road To Eternity"
So it's album number... um... about ninety three I reckon. Either way, it's always good to see Magnum back, and always a pleasure to digest yet another stunning cover from Rodney Matthews before you even get to the music. Drenched in fantasy imagery, it perfectly illustrates the album title, and suits the music beautifully, and when Rod and Magnum are in sync like this you know you're in for a treat. The lead track, 'Peaches & Cream', really sets the mood as it's a bouncy track that will bring back happy memories for long time fans of the band who feel that they have been missing some of the smooth flow since they entered the 'part 2' phase of their career. This contunues into 'Show Me Your hands', but is interrupted by 'Storm Baby', in itself a ballad with big riffs stuffed into it that works really well. No song is short here, with everthing trundling it at five minutes or more. Whilst there's also no ten minute plus epics (something we could do with, to be honest) the longest track is the wonderfully titled 'Welcome To The Cosmic Cabaret', which clocks in at just over 8 minutes. It's one of those tracks, though, that doesn't seem half as long as it is. There's a slow, thoughtful ending with some nice guitar from Tony Clarkin, and to be fair it's a great way to end a great track. Track five is by far my favourite, and it's the title track. Not only does it have a superbly catchy chorus but also features a duet between Bob Catley and Tobias Sammet. New lad Rick Benton provides the sort of keyboards that Mark Stanway would have been proud of, and the whold thing is drenched with genuine strings from the Wolf Kerscheck orchestra. Seriously, this may just be my favourite Magnum track of the 21st Century. The track that's being used to promote the album is 'Without Love', and it's a nice track with grit and bounce in equal measure. I think 'Peaches & Cream' would have done the job better, but the two share a core mechanic and both will no doubt be well received live. It kicks off the album's second half, a second half that doesn't quite manage to meet the very high standards set by the first. 'Tell me What You've Got', for example, just doesn't stick in the mind regardless of the amount of plays, whilst closer 'King Of The World' treads a similar path, although it finishes in fine style. On the other hand there's still a few belters in the shape of upbeat rockers 'Forbidden Masquerade' and thae catchy 'Ya Wanna Be Someone', whilst 'Glory To Ashes' is a bit of a riff heavy mid paced effort but makes up for it with a great refrain and a cool atmosphere. Considering this is the 20th studio album (thanks Google) by the band, it is a commendable acheivement. The sound is fresh and invigorating for the most part, unmistakenly Magnum and a delight to get to grips with. Bob Catley sounds amazing throughout, and songwriter Clarkin has cobbled together some memorable tunes. I never get tired of Magnum, and am so glad to see such a quality release this far down their career path. This is indeed rock art, so take a look. Saxon: "A Decade Of The Eagle"
So where were you in '79? Were you wearing denim and leather, or were you like me and still a wee bit young for all that heavy metal malarkey? I soon caught up, however, with Saxon having the honour of being my first gig headliners on the 'Crusader' tour. Sinnve discovering the band I've never fallen out of love with them, and this compilation from their first decade as recording artists really brings back happy memories. Whoever put this 34 track double album together has definitely hedged their bets, producing a solid 'Best Of' that befits the title. With the extreme quality of some of the albums covered within it's inevitable that some favourites will be missing, although the singles are here along with quality album tracks. It all kicks off with early faves 'Stallions Of The Hiughway' and 'Big Teaser', followed by 'Backs To the Wall' and 'Militia Guard'. Although from the band's fledgling period, they still entertain, with funky, heavy rythms all held together by the unmiustakable vocals of Biff Byford. From then onwards it's wall to wall quality, starting with the legendary 'Wheels Of Steel' and going right through to 'Red Alert' from 1988's 'Destiny' album. Not once did I think 'why is this track on here', which is a bit of a rarity for a best of compiliation. 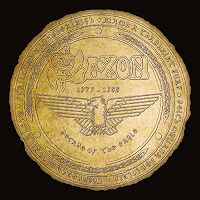 'Decade Of The Eagle' does exactly what it says on the tin, delivering a pretty perfect collection from one of metal's most constantly entertaining bands who, judging by their latest single, are still on top form all these years later. It's one of those that may not be needed by fans with all the albums already a couple of live tracks aside) but it's nonetheless a sweet package that will bring a smile to the face of any metalhead to unwrap it on Christmas day.